First stand up comedic VR experience EVER! Starring Trevor Noah! Last weekend I was in NYC to create a VR experience for Trevor Noah. It was an amazing experience and I can't wait for everyone to experience it. I am truly honored to work on what's quite possibly the first ever stand up comedy special in VR. Trevor Noah is making history! Experience “Autumn”, a cinematic virtual reality experience. It’s not a story. It’s not a film. It’s a personal experience tailored for you. Experience the ups and downs of loving her. Love her or leave her, it’s up to you…. But in the end you can’t help to be changed by her. “Autumn” a Narrative AI VR experience. Coming soon! I'm excited to announce Greymatter Vr a website I created to further Virtual Reality creation, production and education. Check it out. On the cover of AUVSI magazine. 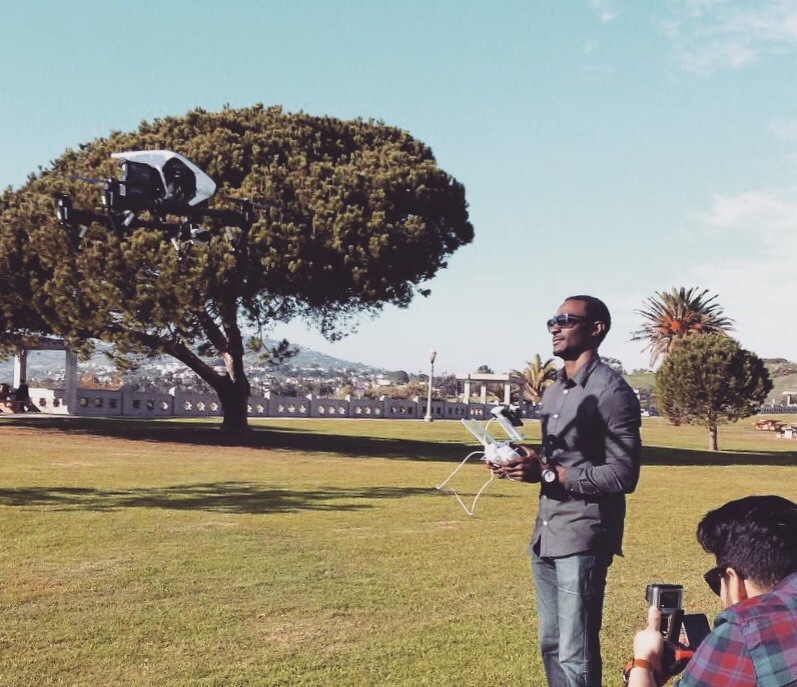 They published an article about me and my work on drone policy in Los Angeles. I'm happy to have been apart of this journey and I'm looking forward to continuing to be an advocate for drone policy in Los Angeles and the United States. This is the first episode of my video podcast where I deconstruct VR, film and drones. In the first episode I demonstrate how to set up a racing drone. First things first, Virtual Reality cinema is a misnomer. The reason being, in VR you create an experience and not just tell a story. Therefore, the language of cinema is simply obsolete. Filmmakers are having a hard time coping with the uncertainty and lack of control, but they are learning quickly. This article pushes the bar a bit further by defining a Narrative AI (artificial intelligence) strategy for cinematic Virtual Reality. The four types of cinematic VR are mapped in the image above. In “Ghost”, the viewer is an unseen observer. By contrast, “Character” is where the viewer is an actual participant in the drama – thus allowing interaction in the world. Out of the four types of VR, 360 video is the least common denominator. It’s so low in fact that most VR purists don’t even consider it VR at all. In 360 video, you can move your head in a shot and see all around which is way cool but it’s entry level VR. The real goal of VR is to put the viewer in the scene as a participant who’s able to influence the story. This is represented by the “Character with Impact” box in the image above and it’s the highest form of VR. Later this year, VR penetration will start to accelerate and a thirst for quality content will follow in years to come. It’s now possible to create next generation VR … here’s how. In real life we create stories out of experiences we’ve had with people and environments. What type of world will give the viewer a rewarding experience? What type of experience do I want them to have? What characters inhabit the world? What are the character backstories? Where will these characters take the viewer and what emotions will they experience as a result? At face value, these questions appear similar to questions you ask at the beginning of any story outline but the difference is that the emphasis is on experience. VR is inherently non-linear which demands experience-based storytelling over linear storytelling. In experience-based storytelling an emergent narrative reigns over a linear based narrative and that starts with the world. Many psychological studies have been conducted on VR’s ability to enhance emotional connection to material. The sheer fact of putting on the headset allows for far greater emotional responses than we get from cinema. However, the key to unlock VR’s potential relies on the creators ability to maximize the viewers immersion in the world. This is another argument for aiming for the “Character with Impact” square in the image above. Allowing the viewer to become an active participant who impacts the story is the key to immersion maximization. The research shows a direct correlation between immersion and emotional impact. This is the secret sauce of immersion. This is how you make the viewer a participant that affects the story – through collect nodes and story modes. Collect nodes learn about the viewer by collecting inputs from the user in order for the story nodes to later make decisions to maximize immersion. They collect tactile input (controller, or movement), audio input (speech, laughter), and visual information from the head mounted display (HMD). The collect nodes are placed at strategic places in the world in order to learn the greatest about the viewer. For instance, if you’re making a comedy and you’ve placed a comedic character in the world you may want to test if the viewer is engaged and also if they’re laughing. Collect nodes can get this type of information. Story nodes change the experience for the viewer based on the inputs collected from collect nodes. To continue with the previous example, if we’ve collected information from the viewer that suggests that they like a particular type of comedy (via laughter and attention … i.e visual input) then the story node may branch the experience in a way to highlight this character and this type of comedy. While in graduate film school at USC, I made a film that performed this task in a simplistic form. It was a comedic film that listened for laughter and changed the story if laughter was detected or not. It was a test on whether a particular form of comedy (physical, slapstick etc.) worked for the viewer. It was developed in Flash using filmed elements and actionscript. The project was ahead of its time but it was useful as a precursor to the theory presented here. The above narrative AI flow shows how collect nodes and story nodes work together to shape the experience over time. The flow appears linear because I put time on the X axis but the flow is really a non-linear experience. Story nodes are allowed to loop back and across into others – thereby creating a web of interactivity and possibility. It’s a new medium so take the challenge and think about how to tell stories in a new way. Take 360 video to the next level by adding a narrative AI! LOS ANGELES, California, June 21, 2016 — A jury returned a unanimous “not guilty” verdict yesterday in favor of Arvel Chappell III, the first person charged under the City of Los Angeles’ recently enacted anti-drone ordinance, in what was the first case to go to trial on a drone-specific criminal charge. that the federal government can continue to develop national regulations that safely incorporate drone technologies into people’s day-to-day existence. The verdict was particularly significant because it came on the same day that the Federal Aviation Administration (FAA) released long-anticipated rules that now allow the commercial use of small drones without special permission. “All along, I’ve maintained that I would never do anything to put a fellow aviator in harm’s way, so this verdict validates that,” said Chappell, a filmmaker and aerospace engineer. “And now that the judge has ordered the City to return my drone, I can continue my filmmaking,” Chappell added. Ironically, Chappell’s most recent film—Compton: The Antwon Ross Story—is the story of a young African American male who turns to aviation as a means of avoiding getting caught up in the criminal justice system. The jury’s “not guilty” verdict brings to a close a long legal battle between Chappell and the City of Los Angeles, during which Chappell challenged the constitutionality of the municipal charges against him as “preempted” by federal law, which the U.S. Supreme Court deems “the Supreme Law of the Land.” That challenge resulted in a dismissal of many of the charges against Chappell, leaving to a jury only the question of whether he operated his drone in a “careless or reckless” manner. The jury concluded he had not. “In the end, what resonated with the jury is that drones are an emerging technology that should be embraced not stifled,” said Terrence Jones, Chappell’s attorney, a former federal prosecutor now with the law firm of Ballard Spahr LLP. “As long as we all fly responsibly, we can all share the airspace together—private citizens, commercial businesses, and government agencies alike,” Jones added. That's why I haven't been blogging or podcasting for over a month. Why? Hollywood asked for a rewrite. I shared the script with a producer who took the unprecedented step of sending 2000 words of notes. Some of his suggestions were changes I was planning to make while others were things I'd resisted to change. This wasn't the first time someone on my query list gave notes but this was by far the most comprehensive. All the notes I've been getting back were all starting to sound the same so it was time for me to finally listen. 70 pages deleted and around 46 new pages written. Every scene touched. The script is more artsy, raw, shorter and thus less expensive to make. All good things. Is it a different film? It's the same film but told in a much different way. The basic structure remained the same. Not to get all film schoolish but above is my general sequence structure that I try to follow in my work. I mentioned it in podcast 11 and you can download it here if you'd like.